"He had drawn many a thousand of these rations in prisons and camps, and though he'd never had an opportunity to weight them on scales, and although, being a man of timid nature, he knew no way of standing up for his rights, he, like every other prisoner, had discovered long ago that honest weight was never to be found in the bread-cutting. There was short weight in every ration. The only point was how short. So every day you took a look to soothe your soul - today, maybe, they haven't snitched any." Most people contribute to Aleksander Solzhenitsyn a sense of moral reflection and conscience. In his masterpiece work, the prisoner in the gulag, faces the stark reality that the powers of forced compliance are capable of the worst degradation and depravity, not only toward the single dissenter, but to all of mankind. While Solzhenitsyn is adept and skilled in literary style and composition, it is the strength in his moral message that separates him from other chroniclers or men of letters. But there was another Russian patriot that had even a more remarkable transition that shared that message of honest outrage towards a state that embodied totalitarian evil. His name was Andrei Sakharov. His renown in history will note his achievements as a physicist, known as the "father of the Soviet hydrogen bomb". But his real significance is as one of the twentieth century's most ardent and unrelenting champions of human rights and freedoms. Often the Nobel Peace Prize is awarded to rogues and frauds, but in this case it found its righteous home. In many ways Russia seems like a very alien land to many from the West. However, to the elites within the corridors of real power, where policy is ultimately decided, the motherland of the Soviet regime is a very familiar place indeed. The Russian people, are no different than us when it comes to human aspirations and flaws. While their culture conveys a record of strong rule under czars, their recent encounter under the boot of 'collectivist communism', has brought untold suffering and cruel compliance to a level that betrays her own history. The Cossack tradition represents independence in thought and action. Sakharov was a creature of Moscow more than the steps of the Tartar region. He did not experience the brutal torment in a Siberia gulag, but he was subjected to the humiliation and disgrace that exile brought, when banished to Gorky. Through all this, he maintained the resolve of a "White Russian", while coexisting in a Glasnost regime. "The Deputy Procurator of Gorky explained the terms of the regimen decreed for me: overt surveillance, prohibition against leaving the city limits, prohibition against meeting with foreigners and 'criminal elements,' prohibition against correspondence and telephone conversations with foreigners, including scientific and purely personal communications, even with my children and grandchildren. I was instructed to report three times a month to the police, and threatened that I would be taken there by force if I failed to obey." In an age where technology is worshipped as the only deity, Sakharov was a prince. But the horror of global annihilation, unleashed by rival empires intended to risk the unthinkable caused this scientist to transfigure into a man of dissent. He would become known as the spokesman for the conscience of mankind. Don't confuse his protest against the creation of weapons of mass destruction, for he remained committed to spirit of the new physics and admits that while: "no one asked whether or not I wanted to take part in such work. I had no real choice in the matter, but the concentration, the total absorption, and the energy that I brought to the task were my own . . . "
He also confirms: "What most troubles me now is the instability of the balance, the extreme peril of the current situation, the appalling waste of the arms race... Each of us has a responsibility to think about this in global terms, with tolerance, trust, and candor, free from ideological dogmatism, parochial interests, or national egotism." Quite possibly this is the kind of social consciousness that is so lacking in the absence of a global conscience. The NWO dominion is the extension of the "evil empire" that Ronald Reagan brought down. People often fail to grasp and repeatedly refuse to acknowledge the historic fact that Marxist underpinnings are the same nefarious theoretical rationale that drives the New World Order. The West has already descended into a "neo-dark age", not because of the existence of technically advanced science, but because technicians are so willing to apply those discoveries to immoral uses. The choice to perfect the next instrument of high tech terror, always is reducible to the deliberateness of the individual, to accept and perform evil. How many seemingly normal and upright neighbors do you know that have worked on the technical developments and apparatus that allows for the total obsessive, repressive and oppressive society that is the sinister model for our future? Scores of friends or family labor at careers that provide the tools for the elites that establish policy. While the magnitute of dread in an H-bomb may evade their culpability, none of us can escape the consequences from their efforts, when applied to controlling society. The responsibility for the implementation of the planned penal colony, rest with those who carry out its construction. Solzhenitsyn emphasized that Russians "have done evil on a massive scale and mainly in our own country, not abroad, not to others, but at home to our own people, to ourselves." Doesn't that same conclusion apply to the West and any other nation that accepts the dictates of global rule? The road back to sanity, for Solzhenitsyn seeks "repentance," followed by national self-limitation, a conscious decision to restrain a nation's appetite and unbridled pursuit of growth. Repentance is "only the clearing of the ground, the establishment of a clean basis in preparation for further moral action." Without repentance, reform is not possible. Sakharov earned and deserves his Nobel Peace Prize because he atoned for his bad judgment for generating a nuclear weapon that he fully knew would be placed into the hands of wicked despots. He then acted upon his remorse and became a dissenter. 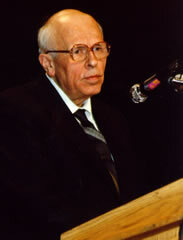 The reform that Solzhenitsyn appealed for, was sustained and fostered by the defiance of Sakharov. Now that it is clear to all, willing to see; that former empires are merging into one absolute totalitarian global force, who will challenge that power? Will you follow in the foot steps of Sakharov and apply his vision to the struggle? Will you accept the Solzhenitsyn mission in life - to speak the truth to those in power? Or will you just follow orders and become a jailer for your fellow citizens, in the 'community prison' that is the 21st century gulag, which Ivan Denisovich would fear more than the harsh and isolated environment of Siberia. James Hall, AKA Sartre, is the driving force behind Breaking all the Rules, a collection of his essays. Published originally at EtherZone.com.